Colorize Your Business, Expand Your Vision. The CPX4 Series, comprising of CPX4P and CPX4D models, is an advanced digital label printing solution, allowing for customized label design using pigment or dye based inks with astonishing resolution quality at industry leading speed. With the benefits of digital label printing, TSC’s CPX4 Series is capable of producing short-run label widths of 1″ (25.4 mm) up to 4.72″ (120 mm) with variable data more cost-effectively compared to pre-printed labels. The CPX4 Series makes it easy to create and print out multiple label designs with vibrant color in less time. With the TSC Color Management program, colors are printed accurately and at a resolution of 1200×1200 dpi, images, barcodes, and text are always clear. The CPX4 Series is a perfect fit for any and all applications to meet the constant influx of new market demands for clear, high quality labels. It’s the hassle-free solution for businesses that want flexibility for creating labels without compromising quality and time. And with a one year warranty, TSC provides all around support from our dedicated TSC team. The official launch of CPX4 Series will start from United States and European, on Oct. 18th. Other regions will be announced later. With an industry leading print speed of up to 11.8 ips, the CPX4 Series is the ideal solution for printing colorful, high quality labels that are easily adaptable to market demands. The CPX4 Series is designed for on demand full color labels providing full color images, clear text, and sharp barcodes at a print resolution of 1200 x 1200 dpi. Our ink is able to sustain its quality over time, maintaining color that is both waterproof and highly durable. With the ability to produce high quality custom labels in house and on demand, the CPX4 Series allows for extreme flexibility for various full color labels without being limited to lead time or MOQ. Media width can be adjusted anywhere from 1″ minimum up to 4.72.” The CPX4 Series is able to incorporate variable data for short-run labels quickly and cost effectively. Deliver GHS-compliant labels and meet industry requirements by printing out labels with the CPX4 Series. The CPX4 Series is the perfect fit for any label that needs to be water, fade, abrasion, alcohol, and smudge resistant. Digital label printing with the CPX4 Series significantly reduces the cost of label printing operations by printing the labels you need when you need them. The CPX4 Series saves time and money by eliminating the need to order pre-printed labels with MOQs. 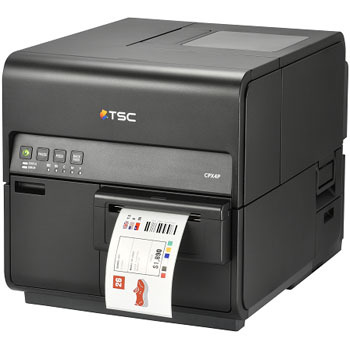 Additionally, TSC high yield ink cartridges can print more labels while reducing the need for frequent change outs. The CPX4 Series includes service beyond just the printer. TSC’s Color Management Program – Color Matching assists with producing precise colors that are clear and accurate. The CPX4 Series offers one-year warranty from our dedicated support team. TSC offers an ink cost calculator service that helps estimate the cost per page ensuring the best ROI. In addition, the CPX4 Series seamlessly integrates with BarTender UltraLite software to design and edit custom labels.